From a recent patient of the IBS Treatment Center. In 1990 I was diagnosed as having either Crohns disease or IBS. They were not sure which. Regardless, it took a serious toll on my health and on my liver. I was treated with some drugs and after a long period of suffering, it subsided. In September of 2014 I began to have reoccurring symptoms. It started out with some abdominal pain, then quickly moved to 2 minute warnings to find a bathroom about 10-15 times a day. Horrible to say the least. I went to the same doctor that had treated me previously and I was put on the same regimen of sulfa drugs and PREDNISONE. I continued to get worse, so the prednisone was increased more and more as were other drugs like Pentasa. I still had no relief. Now the doctor was talking about suppressing my Immune system with a Imuran, and if that failed Humera was discussed. About a month earlier I had watched an interview on TV with Doctor Wangen and a female patient. She was describing all the symptoms that I was having and the terrible change in lifestyle that goes with it. I related. I had told my Gastroenterologist that I felt there had to be some CAUSE for what was happening to me. The answer was always “This just happens sometimes we don’t know why”. Next stop, more powerful drugs. I made the decision to call the IBS center. I made an appointment and I am so grateful that I did. After suffering for about 6 months I finally went into the IBS clinic … in March of 2015. I didn’t write this email right away because I wanted to see what the long term results would be. My Gastro doc AND the liver doc were “skeptical.” The Gastro doc and liver doc only know how to treat symptoms. Its the old saying “To a carpenter, everything is a nail”. They use drugs. For the most part, I feel cured. I cant even imagine what drugs I would be on now, or what new side effects I would be dealing with, instead of going to Crossfit 4 times a week and feeling damn good again. Just feeling normal feels good. The IBS specialists at our clinic will determine the cause of your IBS and focus treatment on the underlying issue so you can be IBS-free for life. 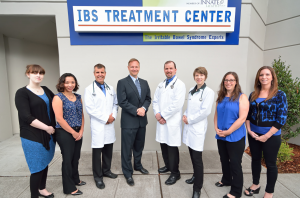 Contact the IBS Treatment Center in Seattle or Santa Monica today.